If you celebrate Christmas, you probably decorate one or more trees and display them in your home, shop or place of business. Do you use artificial trees or live cut real ones? Do you wonder which is better – financially and ecologically? According to a New York Times article last December, there are a bunch of us that have artificial trees – me included. I was getting older and could no longer muscle a 7 foot tree onto the top of a car (being only 5’4” tall doesn’t help either). Our nest was emptying out with the kids going off to school so the fact that they wanted a live tree became less important to me. The fire hazard was (and is) much less than with a live tree. We wanted to leave the tree up longer and an artificial one wouldn’t dry out. We were tired of spending $40 – $50 a year on trees. It was convenient to already have a tree. There was a significant upfront cost – I paid $200. Finding a place to store it all year is still difficult. The tree has no good pine smell. How the heck do I dispose of it? We have used this tree for 15 years now. The financial impact was positive on our family. Assuming we paid $40 a year for a tree for 15 years, we would have spent $600, an overall savings for us of $400 up through this year. However, even artificial trees wear out and this one is starting to go (the very top is getting wobbly). Since I am now wondering how to dispose of it when it is finally no good anymore, I got to wondering what the overall environmental impact of an artificial tree is. 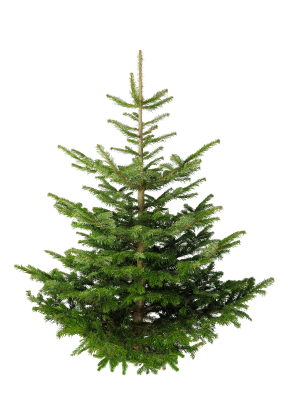 Most artificial trees are made of metal and contain PVC which exudes carcinogens during manufacture. Furthermore, most trees are made in China and have to be shipped over, causing additional carbon emission damage. According to most sources, such as Enviro News and Business there is no good way to re-cycle artificial trees (sounds like a business opportunity!). However, over a period of several years, artificial trees can be cheaper. ones do. On the down side, tree farms are not usually pesticide free – normally doing repeated applications over the 7 – 10 years it takes to grow a sale sized tree. In addition, live trees sometimes are shipped significant distances to their final purchase place and can be more expensive over the long run than artificial trees. Ellipsos (a Montreal environmental consulting firm) did a study in 2009 in which they claim that there is a significant environmental advantage to using a live Christmas tree over an artificial one, but that after using the artificial one for 20 or more years, the impact evens out. The study assumed that the trees would be used close to where grown. If that weren’t the case, then they concluded that the advantage narrowed considerably. Now that I have done a bit of research on artificial vs real Christmas trees, I still don’t know of a good way to dispose of the fake one! I do know now though, that if I want additional trees (and I do occasionally put one up on the porch outside) – I will get out the saw and go cut down one of our teenage cedar trees (the ones that keep popping up like weeds on our acreage). If I should want another fake tree, I WILL be shopping for a gently used one instead of supporting new production. Still, the artificial ones do save us money and are more convenient for us. Someday soon, some smart person will figure out how to make a bio-degradable artificial tree that doesn’t cost an arm and a leg and then this debate might be put to rest. Which side of the great Christmas Tree debate are YOU on, and why? Only real. We can use it in the wood burner afterwards and than it is helps the environment – if everybody’s need a real X-mass tree – there would be more farms, rather than ugly houses. But the most important – it smells and feels real. I like it! I love the idea (and smell) of a real tree, but they generally don’t stand up to the heat during an Australian Christmas. Our tree is fake, still going strong after 6 years. I think we will have to do a real tree soon for the kids, but it is unlikely we would do it regularly based on both cost and convenience. My kids hated it when we stopped having a live tree. They get their own now that they are out on their own – and they always get a live one. We are going with real this christmas! Let’s see how that turns out! I was all for artificial trees, and we have one, but after reading your post, the real tree sounds like a better environmental bet. I actually planted some Austrian Black pine on our acres so that we could let the grand kids pick one out each year for ‘their’ room tree – hoping for them to have some of those fond memories. My husband and I forgo the tree altogether, but we don’t have kids so it works for us. I’m guessing that if we had kids, we’d go with a live tree and eventually figure out a way to have a “living” tree in a pot or something. Though artificial trees are probably more cost-efficient, the recycling part sounds tricky. Thanks for sharing your research! I have an artificial tree. It’s less mess, and burning my house down produces far more carbon than it takes to get my tree home. Ha-ha that’s a good one! I’ve always done artificial trees. I have a tree that I bought in 1996 that I still use. It’s become our ‘second’ tree but it’s still in pretty good shape though I did have to replace the base, as the one that it came with cracked a few years back. The top of ours is getting wobbly. I’d like to fix it but haven’t figured out how yet…. Although I do not have a Christmas tree, my wife decorates our hoy=use for the holidays. She generally includes just a couple real things to add to the feeling and smell of the holidays. It is amazing how just a couple things will make everything else seem real. That’s a good idea. I usually bring in some cedar clippings and burn a scented candle. That does it for us. You guys don’t decorate a tree? My wife loves artificial trees. It’s so much simpler. I’m glad to know that it’s not so uncommon. I’m sensing a theme here of the girls being the decision makers on holiday decorations! Hmmmm, I would, but all of my younger family members want live trees! Are those aluminum trees from the 70’s still hot? It seems like as far as the environment goes, neither is very good. I’m still on the fake tree side for many of the reasons you list. Mostly I just hate the idea that a real tree is cut down and shipped every year to just be used for a month or so. I’m thinking that real trees may be better – simply because they do biodegrade – especially if you get one locally. Cedar trees grow like weeds around here and I usually have to cut them down anyway to make way for the open spaces and other plantings we want to keep. Although most folks don’t typically use them as Christmas trees, they do have a nice smell and the shape allows you to hang lots of ornaments. I typically use one on my portch outside with just white lights. When I lived at home, we always got a real tree, but after that, my fiancee and i got a fake one. We’ve had it for 3 years, and i like it so far. If we ever buy a house though, I think we’d go back to a real tree. Interesting. Why would you do it differently if you buy a house? We just got a artificial tree for our new apt., I prefer it over a real one any day. 7 footer pre-lit for 40 bucks at Home Depot on black Friday:D oh yeah!! That is a pretty good price. I paid close to $200 for ours back in 1996 at Lowes. 7.5 feet, not pre-lit! I guess, like electronics, as manufacturers nail the process, things get cheaper. All through child hood I bought the cheap fake trees. As an adult I only buy real trees. There is something about the smell and the feel of a real tree. It also gives me a sense of “I’m not broke”. How much do you have to pay for a tree where you are?